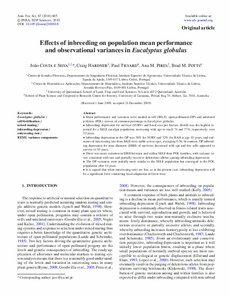 • Mean performance and variances were studied in self (SELF), open pollinated (OP) and unrelated polymix (POL) crosses of common parentage in Eucalyptus globulus. • Inbreeding depression for survival (SURV) and basal area per hectare (BAH) was the highest reported for a SELF eucalypt population, increasing with age to reach 74 and 77%, respectively, over 10 years. • Inbreeding depression in the OP was 36% for SURV and 32% for BAH at age 10 years, and estimates of outcrossing rate from BAH were stable across ages, averaging 0.56. In contrast, OP inbreeding depression for stem diameter (DBH) of survivors decreased with age and few selfs appeared to survive to 10 years. • There was more variation in DBH between and within SELF than POL families, with variance ratios consistent with rare and partially recessive deleterious alleles causing inbreeding depression. • The OP variances were initially more similar to the SELF population but converged to the POL population after 10 years. • It is argued that when outcrossing rates are low, as in the present case, inbreeding depression will be a significant force countering local adaptation in forest trees.